Richard Allen Anderson (16 April 1948 - 24 August 1969) was a Lance Corporal in the U.S. Marine Corps who was posthumously awarded the Medal of Honor for his heroic actions on 24 August 1969 during the Vietnam War. Richard Allen Anderson was born on 16 April 1948, in Washington, DC. At an early age, he moved with his parents to Houston, TX. He graduated from M.B. Smiley High School there in May 1966 and then attended San Jacinto Junior College in Pasadena, TX, for a year and a half. 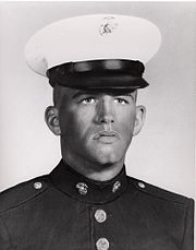 Anderson enlisted in the U.S. Marine Corps in Houston on 8 April 1968. Upon completion of recruit training with the 2d Recruit Training Battalion, Marine Corps Recruit Depot, San Diego, CA, he received individual combat training with the 1st Battalion, 2d Infantry Training Regiment, Marine Corps Base at Camp Pendleton, CA. He then returned to San Diego to attend Sea School. He was promoted to Private First Class (PFC) effective 1 July 1968. PFC Anderson completed his training in October 1968, and was ordered to the Far East, where he joined Sub Unit #1, Provisional Service Battalion, 9th Marine Amphibious Brigade. In November 1968, he was reassigned duty with the 3rd Marine Division in the Republic of Vietnam, and served initially as a rifleman with Company D, 1st Battalion, 4th Marines. In January 1969, he assumed duty as scout and, later, Assistant Fire Team Leader with Company E, 3rd Reconnaissance Battalion, 3rd Marine Division. He was promoted to Lance Corporal effective 1 June 1969. On 24 August 1969, while participating in combat approximately 12 miles northwest of Vandergrift Combat Base in Quang Tri Province, he committed the actions that earned him the Medal of Honor. 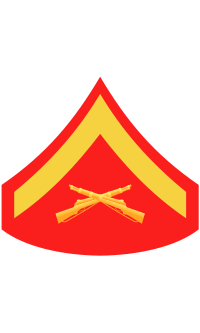 CITATION: "For conspicuous gallantry and intrepidity at the risk of his life above and beyond the call of duty while serving as an Assistant Fire Team Leader with Company E, 3rd Reconnaissance Battalion, 3rd Marine Division, in connection with combat operations against an armed enemy in the Republic of Vietnam. While conducting a patrol during the early morning hours of 24 August 1969, Lance Corporal Anderson's reconnaissance team came under a heavy volume of automatic weapons and machine gun fire from a numerically superior and well-concealed enemy force. Although painfully wounded in both legs and knocked to the ground during the initial moments of the fierce fire fight, Lance Corporal Anderson assumed a prone position and continued to deliver intense suppressive fire in an attempt to repulse the attackers. Moments later he was wounded a second time by an enemy soldier who had approached to within eight feet of the team's position. Undaunted, he continued to pour a relentless stream of fire at the assaulting unit, even while a companion was treating his legs wounds. Observing an enemy hand grenade land between himself and the other Marine, Lance Corporal Anderson immediately rolled over and covered the lethal weapon with his body, absorbing the full effects of the detonation. By his indomitable courage, inspiring initiative, and selfless devotion to duty, Lance Corporal Anderson was instrumental in saving several Marines from serious injury or possible death. His actions were in keeping with the highest traditions of the Marine Corps and of the Department of the Navy. He gallantly gave his life in the service of his country." Lance Corporal Anderson's Medal was presented to his family at the White House by Vice-President Spiro T. Agnew on 15 July 1971. Lance Corporal Anderson's name is inscribed at Panel 19W - Line 110. Lance Corporal Anderson's name is inscribed on the 3rd Reconnaissance Medal of Honor Monument at the Ocala, FL, Memorial Park. Lance Corporal Richard Allen Anderson was killed in action on 24 August 1969. He is buried at Forest Park Cemetery in Houston, Harris County, TX, in Section 33, Lot 257, Space 1.